If you are bringing a new pet into your home, it’s important that they adjust to the new space without the added stress of other animals. A closed bedroom with scratching posts, toys, food and water, and a litter box is the perfect option for a new cat. However, dogs need to roam and so the ideal thing would be to keep your existing cat in a separate area while you train your dog. Placing some of the other animal’s personal items in the new pet’s space during this time will help them to become acquainted with each others scents, which will reduce the stress of the first meeting. When you’re ready to introduce your cat to your dog, ensure the initial meeting is quick - around 10 minutes is perfect. Keep the dog on a leash, and allow the cat to roam around and venture as close to the dog as they choose. Use a halter on your dog if you feel that they may not be completely under control, and be sure to reward them for good, calm behaviour. Gradually begin to increase the amount of time your pets spend together. Once you feel comfortable, allow your dog to also move around freely. Keep the leash attached so you can quickly regain control if necessary. If your cat has lives with dogs previously or is confident around other animals, you are likely to have an easy transition. If your cat hisses or runs from other animals, you will have a more difficult time. If your dog is playful but not aggressive, he will have an easier time adapting to a cat. If your dog lunges, growls or is difficult to control they may never adapt to a cat, and it would not be safe to introduce them. If this is the case, you should consult your veterinarian before doing anything. Keep your pets separated until you are fully confident that they pose no threat to each other when you are not directly supervising them. The safest way to do this is to keep your dog in a crate, or provide your cat with a safe place where they can escape the dog. This could be a separate room with a cat door installed, or even just a cat tree to climb. For your cat to feel safe, your dog needs to be under control and should know basic commands such as ‘leave it’, ‘sit’, and ‘stay’. Before the first meeting between your animals, ensure you spend time practising these commands and rewarding good behaviour. When your dog first sees your cat, ask him to sit. When cats run, dogs chase. If you let him chase your cat, then chasing your cat will become his favourite activity. It is important to avoid this at all costs. 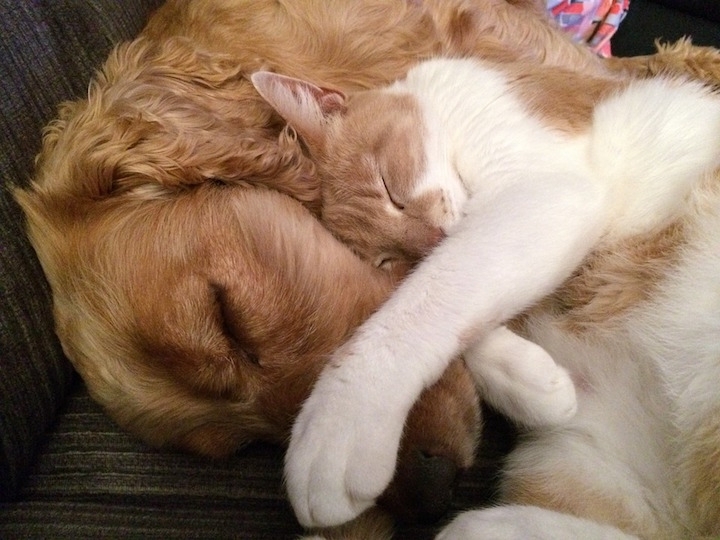 Be patient - it may take weeks or even months for your pets to be comfortable with each other.